Let’s face it – manual tilling can be back-breaking work. A garden rototiller is a quick and convenient way to till and cultivate a garden. And with the right model, you can have your garden plant-ready in no time. This is one of those garden power tools that can literally save you days of work. Whether you are turning over last year’s vegetable garden or creating a garden bed from scratch. A rototiller is a must have. But which tiller is the right option for you? We compare our top picks to help you find the perfect model for your garden. —–Note: All models mentioned in this section are front tine. Electric corded tillers are lightweight, easy to use and environmentally-friendly. They’re not as powerful as gas models, but they’re a smart choice for smaller gardens. While you have plenty of corded electric models to choose from, these four are your best options. Earthwise combines power and efficiency into the compact TC70001. 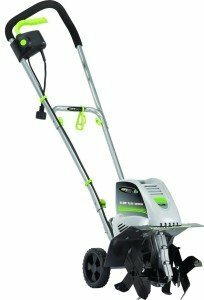 Reliable, affordable and easy to use, the TC70001 makes a great addition to any home garden. And it’s our #1 pick for corded electric models. Lightweight and high-powered, this tiller/cultivator can easily dig through soil and even clay. Users love that the wheels on this model stay out of the way, so you can dig deep. And the fast tine speed makes quick work of even tough soil. With over 1,500 positive reviews, the Earthwise TC70001 is a best-seller and our top pick for corded small garden tillers. 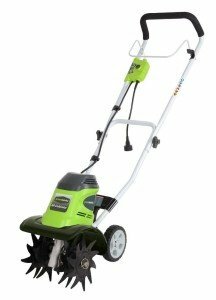 The GreenWorks 27072 is a powerful electric tiller that’s easy to start, lightweight and versatile. With an adjustable tilling width and depth, the 27072 ensures that you dig the right planting depth every time. And with a foldable handle, it’s easy to store and transport. For small gardens, the 27072 is a great option. It’s not quite as powerful as the EarthWise TC70001, but it offers adjustable tilling depth and width, so you can choose the right planting depth for your needs. 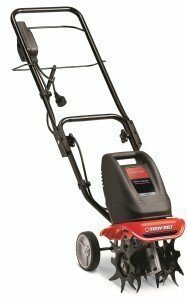 Troy Bilt tillers are some of the best on the market, and the 6.5 amp electric model is no exception. Even heavy clay is no match for this model. 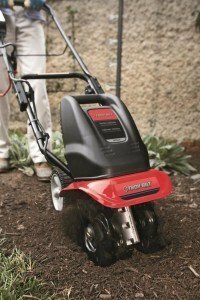 While tilling depth isn’t adjustable like the models in our previous electric tiller reviews, the Troy-Bilt does offer adjustable tilling width, so you can easily get in between plantings. With a 6.5 amp motor, this is a powerful tiller. And it’s light enough for anyone to carry around. 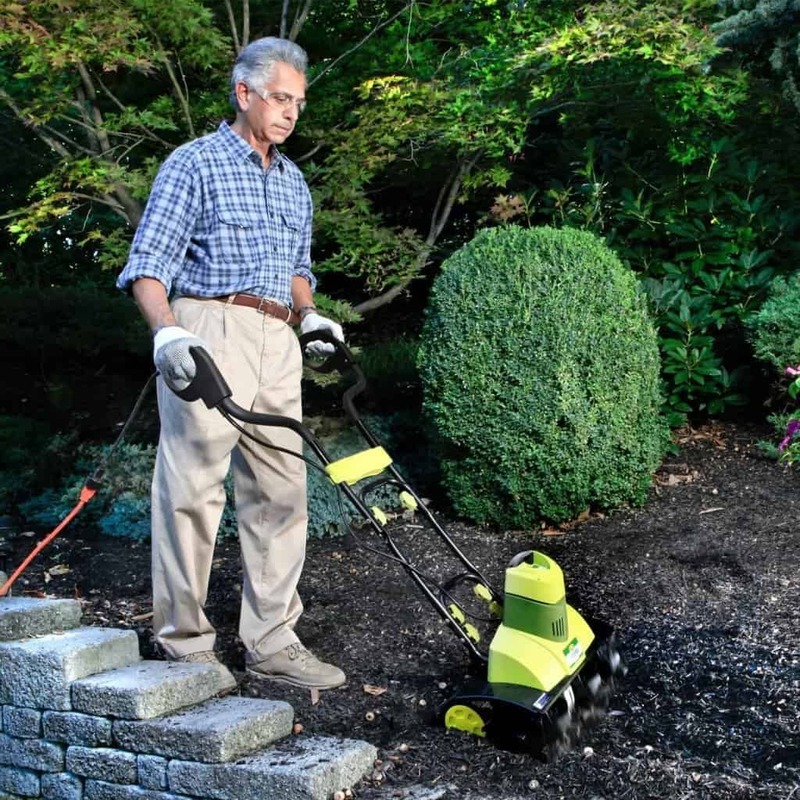 Even users who suffer from arthritis say they can carry the Troy-Bilt around with ease. Looking for a tiller/cultivator that’s powerful and easy to maneuver? 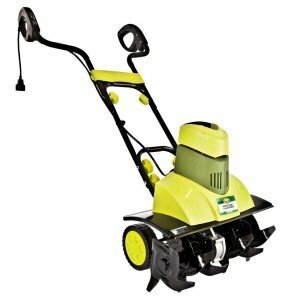 The Sun Joe TJ601E Tiller is a great option. This model has a motor that’s more powerful than our top pick, but it lacks some of the adjustable features that make the other picks so attractive. That being said, the Sun Joe TJ601E is an excellent choice for hard soil and clay. If you need a cultivator that can make quick work of just about any type of soil, the Sun Joe TJ601E is the right option for you. With a wide cultivating width, you’ll get the job done quicker and more efficiently. 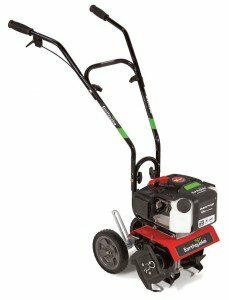 Looking for a rototiller with more power? A gas-powered model is the right choice for you. Able to tackle sod and clay with ease, gas rototillers are great for tougher jobs and larger gardens. And because it’s powered by gas – rather than electric – you’re free to move around the garden without worrying about tripping over cords or accidentally unplugging your machine. The Mantis 7225-15-02 is like having a commercial tiller right in your own backyard. With a 21.2 cc Echo engine, this is one powerful machine. And with a light weight of just 20lbs., this is a rototiller that anyone can use. With a smaller tiller head, you can reach into tight spaces. The curved teeth are tough and powerful enough to dig down 10” deep – even through sod. And the reverse tines allow for cultivating flowerbeds. Plus, the push-button primer makes the Mantis 7225-15-02 easy to start. Did we mention this model is CARB compliant? It’s gentler on the environment, so you can feel good about tilling your garden. When it comes to gas-powered rototillers, it doesn’t get much better than the Mantis 7225-15-02. With an affordable price tag, generous warranty and over 100 positive reviews, this rototiller is hard to beat. The Earthquake MC43 Mini Cultivator may be compact, but it’s powerful enough to dig 8” deep into soil. This model offers numerous options, so you can choose the right planting depth and speed for the job. The Earthquake Mini Cultivator is easily adjustable, lightweight and powerful. It may not offer the same tilling depth as the previous model, but 8” should more than suffice for tilling jobs. Light in weight and easy to assemble, this is a rototiller you can start using right away – and continue using for years. 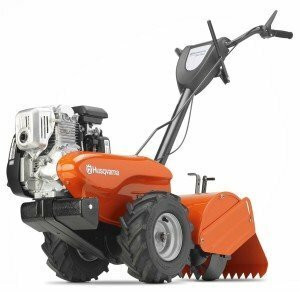 Husqvarna is a well-known name in the lawn care industry. The brand’s rototillers are pricey, but they’re highly durable, reliable and powerful. The Husqvarna DRT900H is a testament to the brand’s quality. The Husqvarna DRT900H offers a powerful engine and a wide tilling width, so you can get the job done faster. One satisfied customer said they were able to till their entire garden plot in less than 30 minutes. Even when tilling hard sod, this machine can make soil plant-ready in one to two passes max. And with a reliable Honda engine, this tiller will start up on the first pull. Here is an easy comparison table of the tillers we reviewed above. No matter whether you’re looking for a corded electric or gas powered rototiller, these models are your best bets. Each one has numerous positive customer reviews and enough power to tackle even tough soil. If you not sure which is right for you, check out the Buyer’s Guide in the next section to see which features are best for your type of garden. Do you own a garden? If so, you’re probably wondering why your crops aren’t growing as fast or why people keep talking about garden rototillers. These are very helpful in ensuring that your plants and veggies are planted into the fertile soil. 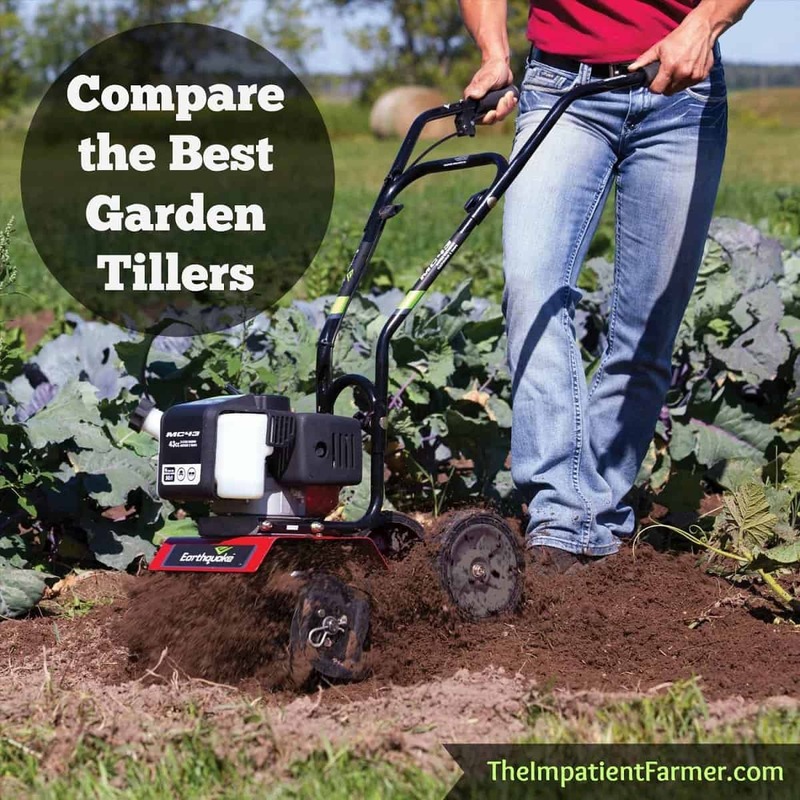 Let’s see what the purpose of the best garden tiller is and how to choose the right one for your needs. In the past, the best tiller was a person’s hands. A strenuous task, people used to have to manually till the soil to get the crops ready for the next planting season. Now, people use affordable rototillers to get the job done. Usually, the ground will be tilled in fall. This is the best time as the soil can settle and break down over the winter. If it’s spring, you can still till the soil as long as the ground is somewhat dry. It’s recommended that you till a day or two after it rains. This will make it easier to till due to higher levels of moisture. Now that you know why you need to till your soil, let’s talk about how to choose the right rototiller for the job. Electric or gas? This is always a big debate and highly dependent on where your garden is located. Electric models are pretty powerful and work just as well as gas models, but you will need to be near a power source or rely on batteries. Corded and cordless models both exist. If your garden is near a power source, an electric corded model is a great option. This means that you can till without having to worry about running out of power: battery or gas. Cordless models are always run on battery, and that is their major downfall. If you run out of juice, you’ll need to recharge, and this can take up to 8 hours. However, for smaller gardens, a cordless electric cultivator is a great choice. While cordless may be more convenient, the corded models are more powerful in the electric category. Strong and reliable. Gas models are found on large farms. These models do not require an external power source, and if you run low on gas, you can simply refill and get back to tilling. If you have a larger garden and no close power outlets, a gas model is a great choice. 2 cycle: Requiring a gasoline and oil mixture. 4 cycle: Requiring just gasoline. You won’t find these options with electric models. When it comes to power, you’ll want to pay attention to: AMP, wattage and speed. Oftentimes, the AMP or wattage won’t be present. If they are, go for an AMP of 6.5 or higher. The higher the AMP or wattage, the more powerful the tiller will be. As far as speed goes, this is measured in RPM. This refers to the number of times the blade goes through a full rotation. Do you Want Front or Rear Tines? Tines are a little complicated. There are two main tines to know: front and rear. Front-tine tillers are great for maintenance and soil prep. Ideal for small and medium gardens, these tillers have tines that propel the machine forward while digging. Front tine tillers often have adjustable lengths making them more versatile in the garden. Reverse and forward models exist. Meant for larger gardens or farms. These models have rotating tires that help them move through the soil with ease. This is great for working with compost, or when a garden has already been tilled in the past and you’re working through old vegetation. How Deep Can you Till the Soil? Finally, depth is how deep a machine will dig into the ground. Are you simply mixing compost into the soil or digging a deep bed? Different plants require different tilling depths. For example, lettuce only requires the top few inches to be thoroughly tilled. But you should till the soil deeper for root vegetable or large perennials so they can grow unobstructed by rocks or existing roots. New gardens will require a deeper tine length, so you can really dig deep. How Much Does the Tiller Weigh? Lighter tillers are easier to lift for transportation and maintenance. Heavier tillers will not jump around as much when you hit a rock or other obstruction in the ground. A tiller on the heavier side is normally easier to control when cutting through heavier soil. So if you live in an area with rocky, clay soil, a heavier tiller will be easier to manage. Most tillers have wheels so they are easy to move from one location to another when not in use. But there are a few models like the Manis that have only the tines & a kickstand. Do you Need Specific Attachments? These are all optional and not a must-have, but they are a nice added bonus. Generally speaking, you will pay a more for Gas Models, Extra power & Special Features. It’s a good idea to consider the type of activities you will be performing, conditions & how often you will use it. 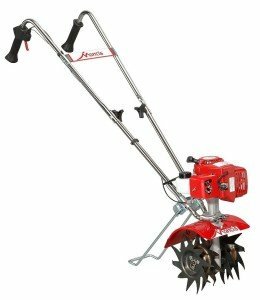 For occasional use in the home garden, the inexpensive Earthwise Electric Tiller/Cultivator may work just fine. However, if you have a need to prepare multiple garden beds in rather tough soil – you may opt for a lot more power in one of the gas-powered units like the Mantis or Husqvarna. Go slow and steady when tilling the soil. Let the tiller do the work for you. Remove rocks, sticks, debris and thick weeds from the garden. Set the tiller depth; shallow for hard soil and medium for soft. Moving slowly, make parallel passes through the garden for best results. Change the tiller to the deepest setting and make your first perpendicular pass through the garden. Examine your soil to see what further work needs to be done. Continue tilling until soil is 8” deep. Wait days or weeks to allow nutrients to settle. Aerate the soil, making a medium-depth pass back and forth across the garden. Using the deepest depth, make a final pass across the garden. This will properly prepare your soil for your harvest. Note: Always read your model’s instruction manual and follow their recommendations for best results. This means soled work shoes and close-fitting clothes. Safety goggles are a must when tilling the soil. Rock or other debris may get loose & you really don’t want to lose an eye! Remove all stones or large foliage from the area you’ll be working in. Examine your machine to make sure it’s ready to go. Never leave the tiller running when you’re not there. Always shut off your model before making adjustments. Wear proper attire when using a tiller – goggles, gloves, long pants and good sturdy shoes. As you get used to your machine, you’ll know when the engine is struggling and will be able to hear when something needs to be adjusted or repaired. Always read through the instruction manual for added safety instructions before you begin. Adjusting depth slowly for best results. Walk on the side of the tiller where the ground hasn’t been worked yet. Only till when the sun is out and visibility is optimal. Never try to till wet soil. Wear work boots for added feet safely. Let soil set for a day or more before you actually begin planting crops – weeks is even better. The best garden tiller will prepare your soil and ensure that when you plant crops, your soil promotes an optimal growing environment. There are a lot of options from electric to gas, but choose one that is perfect for your yard. Gas is recommended if you have acres of land that you want to till. Safety first. Don’t wear loose clothing and always prepare your ground by removing debris and rocks to avoid damaging your machine – it’s a necessity. When looking for the best garden tiller, you’ll be able to find models in every price range that will get the job done. For most home gardens, you’ll spend a few hundred dollars at most for a reliable model. Copyright text 2015 by The Impatient Farmer.